Reduced temperature sensitivity through a reflective surface. Keep sunlight and heat from raising the temperature and pressure within the hose. Twisting and bending will not result in a change in volue across the hose. 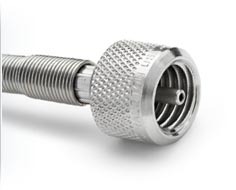 This design feature ensures consistent pressure in hard-to-reach applications. The low volume of Ralston Quick-test™ hoses are ideal for transmitting high pressure while consuming very little compressed gas or fluid. 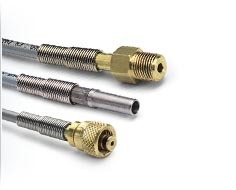 For connections up to 6900 psi our standard Quick-test™ hoses provide a high pressure connection adaptable to all standard connection types and between all types of pressure references and pressure sources. With a maximum pressure of 10,000 psi, the new Quick-test XT series of hoses provides one of the highest pressure ratings of any hose on the market. 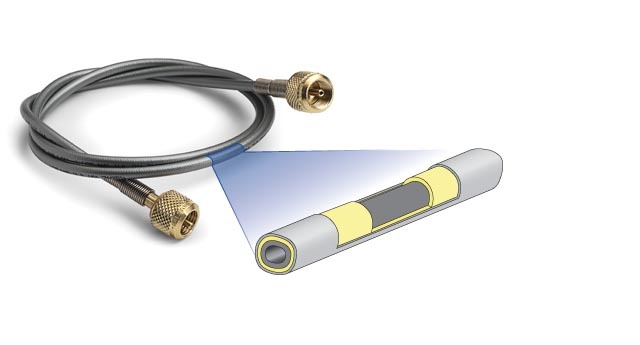 The Quick-test XT uses a unique, proprietary connection that cannot be accidentally mixed with the Quick-test hoses and adapters. Connect to other quick-connectors or to permanent connections. 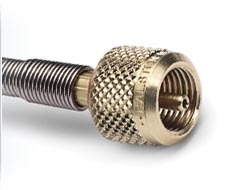 Mix and match standard connections with our Quick-test™ Connections or define your own custom length for your own applications.